October 23, 2013. Give Magic is a clearinghouse of information about philanthropic opportunities in the magic community. It is designed for people who want to donate their time or money to a magic-related cause. My name is Magician Michael E. Johnson from San Marcos, California, and I’m your host. Magic is a powerful force for goodness in the world today. Magicians in every country are using their skills at entertainment, education and enlightenment to benefit communities. I see it all over the place, and it inspires me. Why do the givers give? Because it’s fun, that’s why! Giving gifts the giver. Perform a magic trick that makes people happy. Teach a magic trick to create a new Magician. Donate money to magic-related charities. Give magic gifts to friends, if appropriate, to support the magic economy. Buy magic locally, to help the community. Donate a magic book or DVD to a library. Provide honest feedback to help fellow Magicians improve. Volunteer to perform for worthy causes where magic is needed but cannot be afforded. Donate a magic kit or book to a holiday toy drive. If you want to donate to a legitimate magic program, consider supporting major magic clubs like the International Brotherhood of Magicians, the Society of American Magicians, and the Academy of Magic Arts. I’m a member of all three groups, and I will personally vouch for their credibility. There are other groups worthy of consideration, as well. Here’s a list of possibilities. The Academy of Magical Arts is a non-profit social order devoted to the advancement of magic. Most people know them by their clubhouse, the Magic Castle in Hollywood. I’m a member and I can tell you, this place is fun to donate to. They offer lots of ways to contribute. You can buy neat merchandise through their store. You can attend one of their special events to raise money for neat causes, like the yearly Soapy Smith Party. You can volunteer and perform magic with their community outreach. One of their most popular programs is the Dai Vernon Memorial Fund, which helps magicians in need. Another popular focus for donations is the Magic Castle Library. For info visit www.magiccastle.com, or write Academy of Magical Arts, 7001 Franklin Ave., Hollywood, CA 90028-8600; or call 323-851-3313. I have been a member of A.M.A. for years, and I think they are doing incredible things to elevate magic. The world’s largest magic organization, the International Brotherhood of Magicians, created a non-profit Trust called the Endowment and Development Foundation. The purpose of the Trust is to underwrite charitable, scientific, literary and/or educational purposes, or for the prevention of cruelty to children or animals, within the United States or any of its possessions. The Trust is administered by three trustees, Joseph M. Bertuzzi, Earle J. Christenberry, Jr., and Dr. William E. Spooner, and a Committee consisting of Michael F. Stratman, William Evans, John R. Browne III and Vanni Pule. The Foundation has numerous ways people can contribute, from direct contributions of cash to donations of life insurance, real estate, securities and tangible personal property. Their legal team has developed tax strategies to help donors get the most for their donations. For information visit http://www.magician.org/resources/ibm-endowment-and-development-foundation or write the International Brotherhood of Magicians, 13 Point West Blvd., St. Charles, MO 63301-4431; or call 636-724-2400. I’ve been a member of I.B.M. for years; I even served as President for I.B.M. Ring 76. The group is well-worth your magic donations. Another way to help is through the local magic clubs. They accept donations of money, time and magic, in most cases. 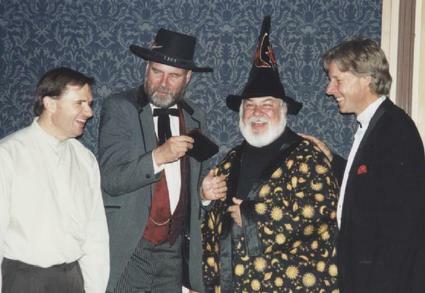 The non-profit Society of American Magicians, the oldest magic organization in the world, has several programs to support magic in the community. The easiest way is to buy their merchandise on-line. Otherwise, consider the Harry and Trudy Monti College Scholarship Fund, which helps full-time college students who are into magic. The Slydini Magic Fellowship Fund helps magicians confined to nursing homes or similar facilities. 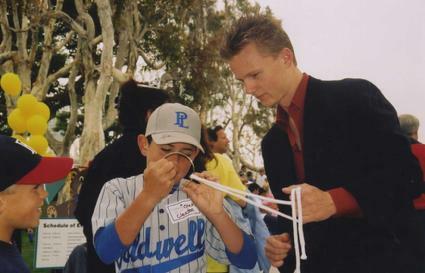 Other activities help students attend magic camps, and assist magicians with travel expenses for teaching assignments. For info contact http://magicsam.com/funds/ or write the S.A.M. Magic Endowment Fund, 234 Towyn Ct., Ambler, PA 19002. Another project is the S.A.M. Magic Center Foundation, Inc., P.O. Box 505, Parker, Colorado 80134; phone 303-521-5120. The center encourages the donations of magic collections. For information contact Executive Director Dan Rodriguez at dan@sammagiccenter.com, or visit www.sammagiccenter.com. A fourth project is the Houdini Fund, which helps magicians who are sick or injured. For info contact Houdini Fund Trustees, 1735 East 26 St., Brooklyn, NY 11229. A fifth project is the Society of American Magician Hall of Fame and Magic Museum, Inc., located at P.O. Box 27610, Los Angeles, CA 90027-0610. The facility is currently accepting Pay Pal donations towards the Restoration Fund. I visited the museum many years ago, and I can tell you it is a wonderful place. I’ve been a member of S.A.M. more than 20 years, and I think it’s a great organization. I try to donate a few extra bucks, every year, when I renew my membership. Perhaps the best way to contribute is locally, through one of their Assemblies. These clubs offer plenty of opportunities for helping, from donations to performing to volunteering to serving as an officer. Magicana is a charitable arts organization in Canada dedicated to sharing magic as a performance art. Its mandate and mission is to explore and advance magic as a performing art. They oversee a variety of projects including My Magic Hands, a youth education program, and Senior Sorcery, to bring magic to senior citizens. Personally, I’ve heard a lot of good things about them. Their Tony Eng Youth Fund provides financial assistance to young people who want to learn more about magic. The Edwin A. Dawes Award for Magic Scholarship is a bursary for those individuals pursuing doctoral studies related to magic. You can make an online contribution with your credit card through www.CanadaHelps.org, or send checks payable to: MAGICANA, 17 Madison Avenue Toronto, ON Canada M5R 2S2. For info visit http://www.magicana.com/donate/ . Project Magic is a program started by David Copperfield to use magic as a tool for rehabilitation and occupational therapy. The program, based at several hospitals, involves volunteer magicians working with therapists to teach sleight of hand to patients with physical difficulties. I’ve studied their resource materials, and it’s awesomely educational. This is the real deal, applying magic to medicine. For more information, visit http://www.tonyko.com/_ProjectMagic/links.asp where there are links to programs in Austria, Belgium, Croatia, Deutschland, Germany and Mexico. You can also write Project Magic, c/o Stormont-Vail West, 3707 SW 6th Ave., Topeka, KS 66606; phone 785-270-4610; or e-mail Julie DeJean at jdejean@stormontvale.org . Healing of Magic is a program designed by Kevin & Cindy Spencer for the therapeutic use of magic tricks in physical and psychosocial rehabilitation. I saw them lecture at an I.B.M. convention in San Diego in 2002, and their presentation moved me to tears. It’s that inspiring! Even Copperfield supports this program. They have developed magic applications that benefit occupational therapy, behavioral disorders and education. Volunteer magicians are encouraged to participate, and it is supported by the International Brotherhood of Magicians. For information visit www.magictherapy.com, e-mail info@magictherapy.com, write Healing of Magic, P.O. Box 10396, Lynchburgh, VA 24506, or call 434-384-4740. The non-profit College of Magic in Cape Town, South Africa, is a beacon of light for that hemisphere. They have numerous opportunities to sponsor a student, donate or volunteer. This program has been operating for 27 years, promoting magic and supporting the community. Supporters include Siegfried & Roy and Richard Kaufmann of "Genii" magazine. For more information visit http://www.collegeofmagic.com/getinvolved.htm or write College of Magic, P.O. Box 2479, Clareinch 7740, Cape Town, South Africa; or call 27-21-683-5480. In Austin, Texas, Kent Cummins facilitates a Magic Camp that offers tuition assistance and scholarships to help those kids interested in magic who can’t afford it. They welcome donations by Pay Pal, too. A $50 donation covers an entire day of magic camp for a deserving child. I’ve seen Kent Cummins lecture before, and I can tell you he’s an incredible magician, and a nice guy too. For information visit http://magiccamp.com/scholarshipdonations/ or you can send checks payable to “Fantastic Magic Camp, L.L.C. Scholarship Fund” to 12316 Indian Mound Dr., Austin, TX 78758; or call 512-850-4677. J. Marberger Stuart Foundation, Inc. The J. Marberger Stuart Foundation, Inc., a private foundation organized under the IRS as a charitable foundation, has a goal to promote magic as an art form. This group does three things: sponsors the annual Dragon Awards to recognize teamwork in magic, gives an academic scholarship to magicians and assistants to further their education, and engages in historical magical research. This program has done much to recognize the most influential magic couples in history. For information visit www.dragonaward.org ; write The J. Marberger Stuart Foundation, Inc., 369 Carpenter Ave., Sea Cliff, NY 11579; or e-mail Jane Stuart, President, magicjane@dragonaward.org . 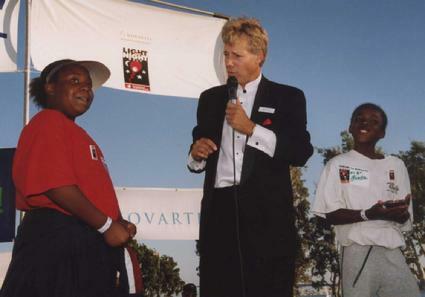 Comedy headliner Michael Finney formed his foundation in 1997 to raise money for children. So far, almost $1,000,000 has been raised, primarily through an all-star comedy review and a golf tournament. This is a magic charity that offers fun in return for donations. For info, visit http://www.michaelfinney.com/dhc/index.php/registration-information/ . You can also write them at the Annual Dry Heat Classic, 7220 W. Melinda Ln., Glendale, AZ 85308 or call 623-581-2537, or e-mail finneygolf@aol.com . Several scholarships are available to the world’s most prestigious overnight magic camp for youth. This year the event was held for Magicians aged 12 - 20 at Bryn Mawr College. This camp is legendary for its curriculum and its roster of participants. They accept donations of money and time. For details, visit http://www.tannensmagiccamp.com/scholarships.html or call camp director Terri Cook at 718-631-8909, or e-mail terri@tannensmagiccamp.com . The Helping Hand Scholarship is awarded to a young magician in financial need. To apply for this scholarship, write a short essay describing a hardship you have had to overcome and how magic helped you through. Explain how you think you would benefit from Magic Camp and how it could help you overcome future hurdles. Submissions must be typed and no more than 500 words. Be sure to include your name, age, grade level and contact information. Scholarship will pay half of the tuition for Tannen's Magic Camp. Applications should be submitted to Scholarships@OperationMagic.org no later than March 15, 2014. The Bob Elliott Memorial Scholarship was created to honor Bob Elliott, beloved camp director for nearly two decades. 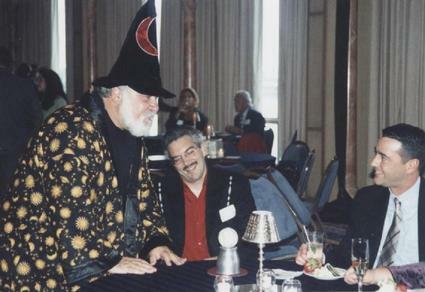 Not only did he give of his time selflessly to the magic community, especially young magicians, he never said NO to helping a community by doing a show, benefit, hospital visit or just being there to make one person smile. This scholarship is awarded to a young magician who is dedicated to community service. To apply for this scholarship, write a short essay describing an instance where you used magic to serve your community. Explain how others in your community have been positively influenced by your magic and the personal benefit you have gained from helping others. Please include a recommendation from someone with whom you worked on a community service project. Submissions must be typed and no more than 900 words. Be sure to include your name, age, grade level and contact information. Scholarship will pay half of the tuition for Tannen's Magic Camp. Applications should be submitted to Scholarships@OperationMagic.org no later than March 15, 2014. Siegfried and Roy created the SARMOTI Foundation to motivate the public to protect endangered animals worldwide, especially big cats. The group offers scholarships and grants to programs working to prevent the extinction of big cats. For info visit http://siegfriedandroy.com/?page_id=85 or call 702-647-2225. Open Heart Magic is a non-profit program that brings magic shows bedside to children in hospitals. They welcome corporate sponsorships and individual donations, with a simple click to http://www.openheartmagic.org/sponsorships-donations/ . They also sell some merchandise. For more information, write them at 33 S. State St., 4th Floor, Chicago, IL 60603; or phone Michael Walton at 312-6224-8079. This non-profit group was created by Ricky D. Boone and T.J. Shimeld to teach magic and showcase the abilities of the disabled. They accept donations with a convenient Pay Pal button. They sell motivation books, book magic shows and sponsor a monthly magic show in Asheville to raise money. For info visit http://www.vanishingwheelchair.org/donate/ or write 1129 Allman Ridge Rd., Morganton, NC 28655; or phone 866-407-9463. Founded by Chuck Katis, this non-profit group focuses on bringing magic to young cancer patients. They welcome volunteers and donations. For info visit http://www.themagicofmiracles.com/index.php?option=com_content&view=article&id=6&Itemid=6 or write P.O. Box 6932, McLean, VA 22106, e-mail ckatis@themagicofmiracles.com or call 207-604-8331. Non-profit Magicians Without Borders performs magic shows for children in refugee camps, orphanages and hospitals around the world. It was formed in 2002 by Tom Verner and has since reached 30 countries and half a million people. They have several ways to contribute: volunteering, fundraising, and supporting the scholarship fund. They have a convenient Pay Pal button for donations, http://www.magicianswithoutborders.com/donate/ . For info, call 820-453-5425. The Fellowship of Honorable Magicians is an independent group which supports community service through the magical arts. The group holds no meetings, nor collects any dues. All money, and all time, is devoted to giving magic to the community. In the past, the group has focused on honoring local magic heroes, seeing them as positive role models among Magic Givers. These campaigns have drawn widespread support, from The White House to Congress to the Governor’s office, to the County Board to the City Council. The group also supports the Give Magic website. What do you do, to give magic to the world? If you have a magic giving experience, please e-mail it in. If you know of a great charity, let us know. Let's share our discoveries, build momentum, and create a Give Magic movement in society. Send an e-mail to mjohns341@cox.net and we’ll share it with the world. The California Magic Quartet always has fun when they give magic back to the community. 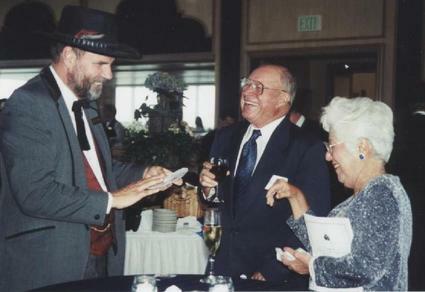 Magic Mike Stilwell of Rancho San Diego is a legend among magicians, both for his sleight-of-hand and his giving spirit. 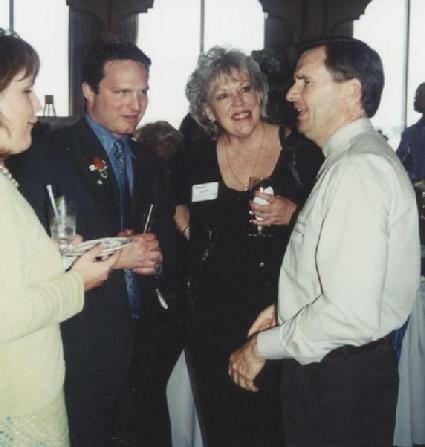 Here he delights guests at a fundraiser at the Bahia Hotel. Joe Mystic of San Diego performs on stages around the world, but when it comes time to raise money for an important charity, he dons his wizard robes and wows audiences with close-up magic. Mentalist David Winston of El Cajon performs around the country, yet he still enjoys helping out at a community event on Mission Bay in San Diego. 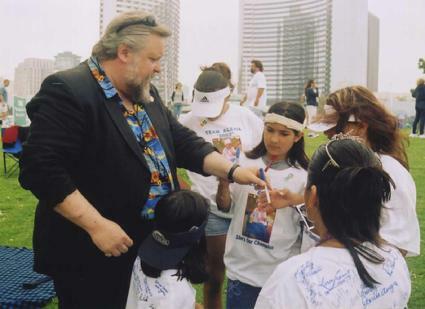 San Diego's Entertainer of the Year, Magician Michael E. Johnson of San Marcos shares a moment on stage with volunteers on the San Diego Bay. Jeff Marcus from Santee is on of America's top hypnotists, but he rolls up his sleeves to do magic when the community needs him. Joel Ward of Cardiff has performed for millions of people on national television, but he still gives his personal attention to special events for community causes. This page may be reproduced over and over and over by those who care.